The brain is the most complex structure in the universe. In Brainstorm the Wellcome Prize-winning author of It's All in Your Head uncovers the most eye-opening symptoms medicine has to offer. 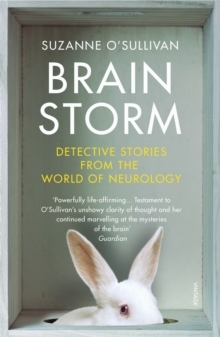 `Powerfully life-affirming... Brainstorm is testament to O'Sullivan's unshowy clarity of thought and her continued marvelling at the mysteries of the brain' Guardian Brainstorm examines the stories of people whose symptoms are so strange even their doctor struggles to know how to solve them. A man who sees cartoon characters running across the room; a teenager who one day arrives home with inexplicably torn clothes; a girl whose world turns all Alice in Wonderland; another who transforms into a ragdoll whenever she even thinks about moving. The brain is the most complex structure in the universe, and neurologists must puzzle out life-changing diagnoses from the tiniest of clues - it's the ultimate in medical detective work. In this riveting book, one of the UK's leading neurologists takes you with her as she follows the trail of her patients' symptoms: feelings of deja vu lead us to a damaged hippocampus; spitting and fidgeting to the right temporal lobe; fear of movement to a brain tumour; a missed heart beat to the limbic system. It's a journey that will open your eyes to the unfathomable intricacies of the brain, and the infinite variety of human capacity and experience.